Hello everyone. I hope you are having a blessed Sunday. Thanks for taking time out of your day to visit my blog. It's time for a new challenge over at Sentimental Sundays. This week we are challenging you to create something for the Hero in your life. Those of you that really know me, know that I've been through a lot over the years with health problems and most recently being faced with my Mom's declining health. If it were not for those times that Jesus picked me up and carried me I doubt that I would have made it this far. I felt it only fitting to use the "Footprints in the Sand" poem. 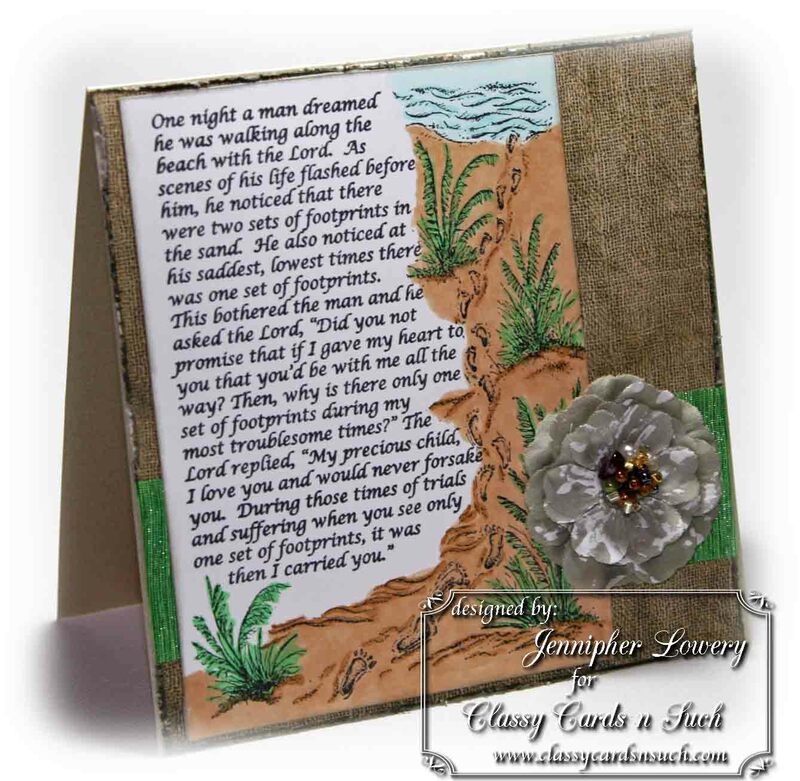 It is one of my favorite sets from Our Daily Bread Designs. 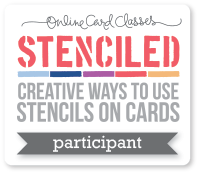 And wouldn't you know it, they have a challenge this week to use your favorite stamp set. Talk about perfect timing! I started with a base of Pearlized Cocoa by Neenah cardstock. To that I added a distressed layer of French Kiss patterned paper by Glitz Designs. I inked the distressed edges with Pumice Stone Distress Ink. I stamped the poem and colored in the scene with Copic Markers. Before I mounted the scene to the patterned paper I added a wide strip of May Arts Parrot Green ribbon across the lower half. For a finishing touch I added a Ceylon Attic Prima. 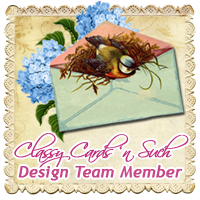 You can find all these products (except for the ODBD stamp) at Classy Cards N Such. Feel free to use my discount code: JENNIPHER-10 to take 10% off your order. 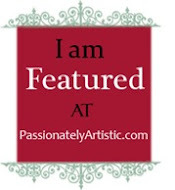 Please stop by Sentimental Sundays to see what my Fellow Designers created for this challenge. Lovely card and great stamp, you colored it all so well. Such a beautiful card and perfect for the 'hero' challenge! Love all of the texture on this!! Just perfect and in so many ways too. Thank you for this. What a beautiful card. This is one of my favorite phrases. Just so perfect for the challenge. Hugs to you and your family!!! Jennipher, a truly amazing card, love this piece of writing showing God's love for us. Gorgeous card! It shows cases this sentiment beautifully. Soooooooo gorgeous, Jennipher! This is one of my fave OBD stamps, too, and you have done this card proud. So much detail, yet the focal point remains the wonderful words of all that He is! Beautiful, beautiful. Absolutely gorgeous Jennipher! I love this creation!! This is one of my favorite, uplifting phrases! Beautiful, beautiful card! I love "Footprints", and you did an amazing job on this card to feature it. wow... what a gorgeous, gorgeous card!! thanks for joining the shining the light challenge this week!! Oh how pretty Jennipher!! 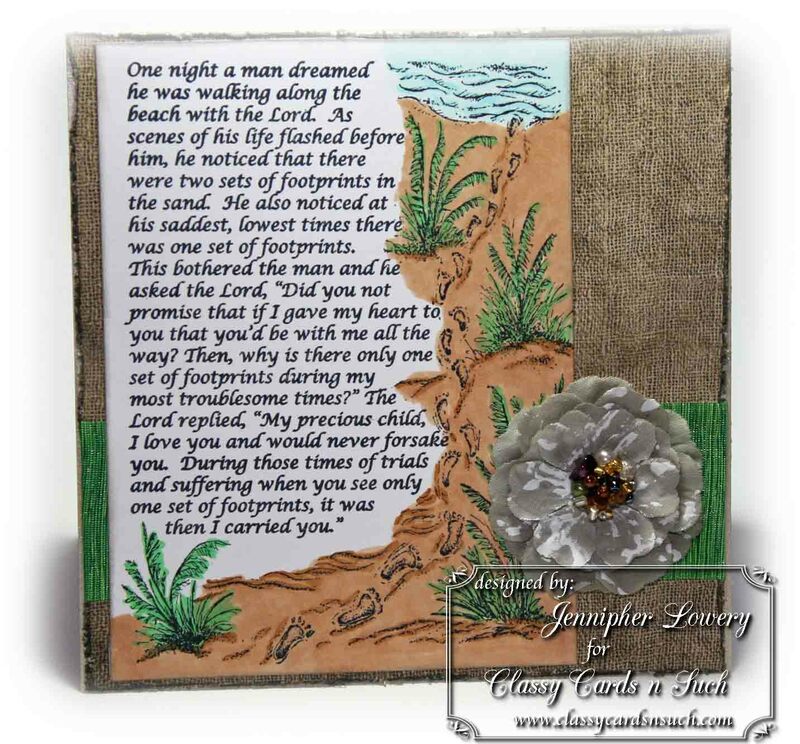 The background paper looks like real burlap and that footprints in the sand stamp is perfect with it!! Beautiful coloring! 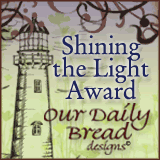 !Thanks for joining the ODBD Shining the Light challenge this week! !